“…and the Word was God.” The Word is still God. 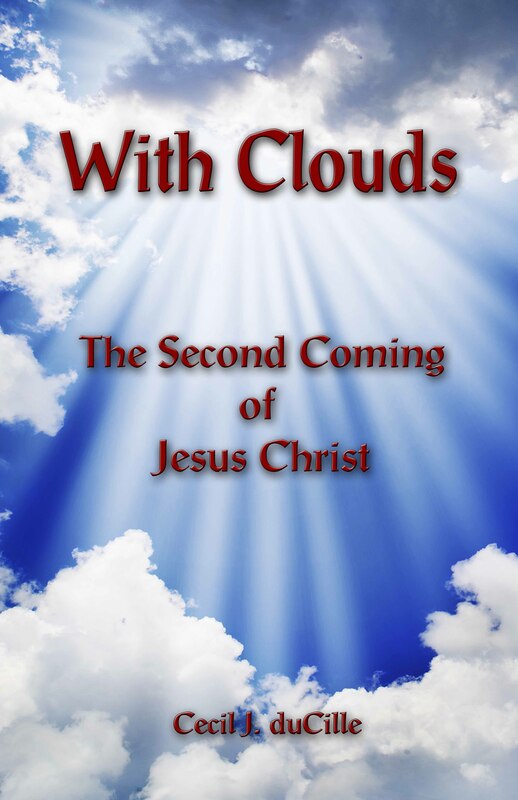 He is still walking among us and living with us; and every utterance of God is God whether spoken through the Christ within or the Christ without; it will create or destroy as God Himself. “My little children, of whom I travail in birth again until Christ be formed in you” (Galatians 4:19). “And she brought forth a man child, who was to rule (shepherd) all nations with a rod of iron…” (Revelation 12:5). The flaming sword that bars the four entrances of the soul will destroy anything human and carnal which tries to enter. The burning at the altar of incense must be complete before we can enter through the veil. Note that the veil has cherubim all over it. This is a symbol of the cherubim in the Garden of Eden. Anyone who dares to enter in will lose his life. If you think I mean he will just die, you are sadly mistaken. I mean he will lose himself totally and immediately would be persecuted by his own. He would be dubbed as absolutely crazy and his goods and estate would be taken and shared up among his family and friends as if he were dead. We had a friend who was so touched of the Lord that he began to give away large sums of his vast riches to the church. A restraining order was brought against him by his son and he nearly got himself thrown into the asylum as being demented. You may call it the travail of the church, the burning at the altar of incense, or the great tribulation. All of these names would suffice, but our souls must be stripped of the body of this death (human thinking, feeling, hoping, and desiring) before we can receive the full power of the life of the Divine God in the soul. At present this power is in our spirits and by various means He is bombarding us to make the life (or, the Christ) come forth in the soul. The Word says that tribulation worketh patience, but I know now that it is not just patience that it works, but every grace given us of the Spirit. It is the fire that is promised by the Holy Ghost as a baptism of fire, which burns the dross out of the silver and the gold. Upon feeling the slightest sickness or pain, we run to the doctor, and our terror is complete as we hang upon the word of the doctor for his diagnosis. We are afraid of fire; we are afraid that God might burn us to cinders. In our trust and confidence in God, let us trust Him to burn the dross out of us so that when the prince of this world comes, he will find nothing in us. “And they overcame him by the blood of the Lamb, and by the word of their testimony; and they loved not their lives unto the death” (Revelation 12:11). “If ye abide in me, and my words abide in you, ye shall ask what ye will, and it shall be done unto you” (John 15:7). 1. Abide, abide, abide in Jesus Christ. 2. Let the Word abide in you. The Word in you as a living person and you in Christ as a living organism – when these come together in divine unison, then every agent of God and nature must obey, for it is the Word of God. Thought for today: The Living Word, Jesus Christ, is in our midst, among us and within us; and when He speaks, it is the obedience to Him that brings the results. The four pillars at the entrance of the Holy of Holies is a type of the four cherubims of Ezekiel 1 and 10, Isaiah 6 and Revelation 4. 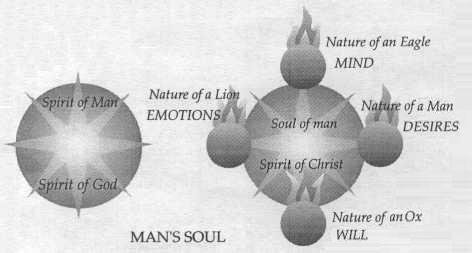 These represent a picture of man’s soul, which in Revelation 4 is mentioned as “four beasts,” and in Revelation 7:1 as four angels of death and destruction standing on the four corners of the earth (soul). To re-enter Eden, we must go through fire. The flaming sword is the Word of God, and the baptism of fire through which man must go to come into perfection. Note that the angel with the sword was at the east of the garden, and the angel of Revelation 7:2, the fifth angel, was rising from the east to seal the saints. The east represents the mind of Christ. The picture of man’s soul is as follows. We could re-enter into this Eden realm, and eventually partake of the tree of life which is Christ, which would re-cycle our nature to the nature of Christ, BUT for these four beasts which occupy our soul realm. Man has the nature of the eagle in his mind, which makes him soar in his thoughts away from God. In his emotions, he is like a lion, a wild savage beast that thrives upon the death of others. In his will, he is stubborn as an ox. In his desires, he is a man. No other creature desires as much as man. He will desire heaven and hell at the same time. He is a creature of desire. Jesus prepared the way for us by breaking through His own flesh, thus He established the “how” of it, so that we too might break through and be OVERCOMERS. Thought for today: Jesus prepared the way for us by breaking through His own flesh, thus He established the “how” of it, so that we too might break through and be OVERCOMERS.